Last night I read Amy S.'s latest blog post and was reminded of the We Love Jenny Auction which will be held on Valentine's Day. The auction is to raise money for medical and housing expenses for Jenny Reeder, who was diagnosed with leukemia in November and is working hard to beat it! I met Jenny when we were teenagers and have a lot of great memories of our neighborhood, camp, and church activities during our high school years. I was so sad when I found out she was sick... and I hope and pray she will make it safely through this ordeal. So anyway, I decided to go ahead and make something relatively quick for her auction. I found this Valentine Flag tutorial at Nanette's blog--I saw it a couple years ago and finally decided to make one. I made one heart instead of two... The fabrics are mostly from a Love is in the Air layer cake I've been slowly using up. :) I will be finishing this mini-quilt up in the next few days so it will be ready for the auction on Monday! Very cute!!! I hope it brings in lots for Jenny. It is darling. I'm so glad you made it. Fun wasn't it. And easy. 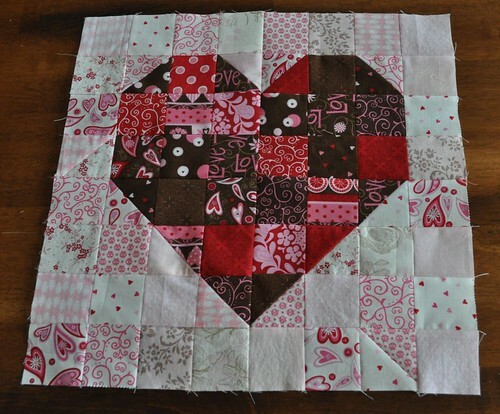 Love the mini heart quilt! I am sure they will too.